Planview Enterprise is an end-to-end portfolio and resource management solution that connects strategy to execution, improving decision-making across the enterprise. 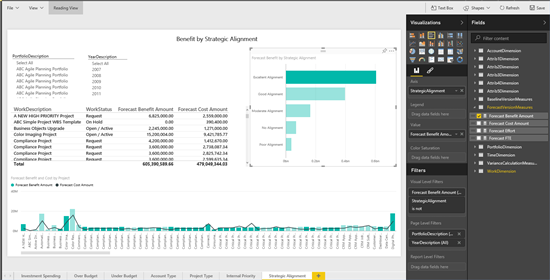 The Planview Enterprise content pack for Power BI allows you to visualize your resource and work management data in an entirely new way. Simply sign in with your credentials and begin to interactively explore your portfolio investment spend, budget status, and how well your projects align with strategic priorities. In this post we’ll cover how to get better insights from your Planview Enterprise data using Power BI. 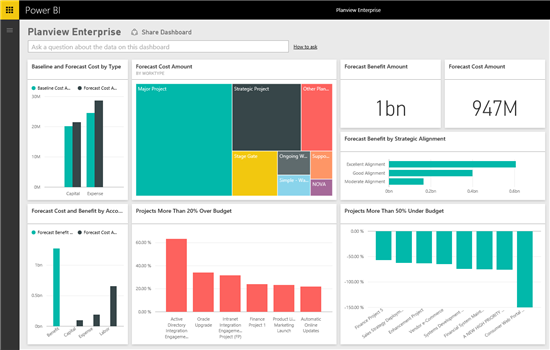 For additional details on how to get started, please see the Planview Enterprise content pack for Power BI help page. Power BI offers an out-of-the-box content pack that connects with your Planview Enterprise data. The content pack includes a curated dashboard, report and dataset allowing you to monitor and explore your data. The dashboard allows you to track key business metrics and visualize important portfolio data. From the dashboard you can drill into the reports by clicking any of the tiles. The Forecast Benefit by Strategic Alignment bar chart will direct you to the Benefit by Strategic Alignment report. This report provides insights into the alignment of demand and corporate strategy. You can view forecasted costs and benefits across the portfolio of projects. Additionally, you can see the impact of strategic alignment on your projects. For further details you can hover over any of the items, or select a value to cross filter the other visuals on the page. If you select a specific level of strategic alignment on the bar chart the entire report is filtered for the selected criteria. You can also choose to customize the report by selecting Edit Report in the top left corner. The view will switch to show you the field list, allowing you to access any of the values and calculations included in this out-of-the-box dataset. Any of the visualizations from the reports can be pinned to the dashboard by hovering over it and selecting the pin icon. After the initial import, the dashboard and the reports continue to update daily. You can control the refresh time and frequency on the dataset. 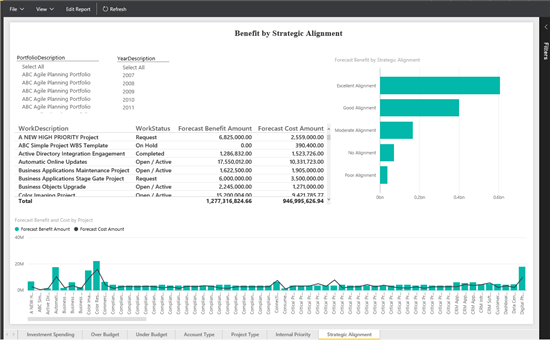 With the Planview Enterprise content pack for Power BI, you have an initial set of metrics and insights around your resource and work management data enabling you to explore your data even further.